Yes I’m alive and no, the website is not down… I just haven’t made a post in nearly a month. Teen, Tanis and I have all been battling the horrible lung infection/cold that has been tormenting Yakutat since last fall. Finally feeling better now. Few if any fishermen through the shop over the past couple weeks (good, so I didn’t spread my disease to anyone). A couple of our frequent fliers for steelhead just left. I think they had 4 trips this season??? 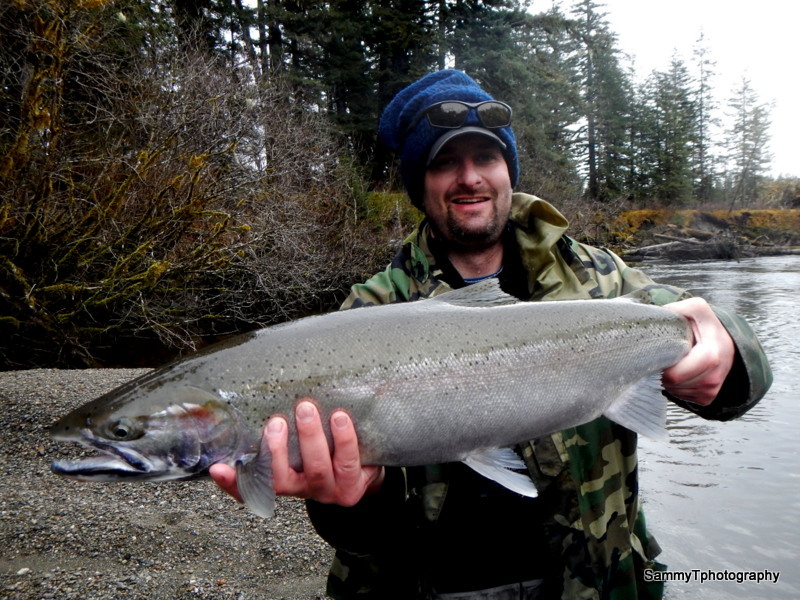 We’re well into June, so I suspect they are our final steelheaders. They said not many fish in the upper half of the float, but they camped in a couple spots down closer toward the weir and had a 50 fish day yesterday. Mostly chromers that have continued to trickle in, even though we’re seeing thousands going out. Yes, ADF&G did eventually get the weir in… Due to the high water flows, they missed about 2 weeks of out-migrating kelts this year. No idea how many fish they missed and no real way to estimate. A LOT could have left during the flooding. The count as of right now is 2,846 kelts. And they don’t show a single sockeye going through upstream yet, even though a couple have been caught up above already. Looking like the sockeye runs may be a week or two behind normal right now. Over on the Alsek River, subsistence nets have not been catching any sockeye and by now they should. And by the way… with business as dead as it is right now, the fly shop will be closed Sunday and Monday for the next couple weeks. We’ll be back to daily ops when people start showing up again. The kids and I are back from our commercial fishing opener on the Akwe. We are having a slightly above average run this season (after last year’s total disaster run), but certainly nothing record breaking. Caught our first two silvers this week, along with several chum and 4 kings (3 jacks). We set the gear at 6am Sunday and started our week catching about 1/4 humpies. At that rate, we’d expect to switch over to majority pinks next week (we only get paid 25 cents per pound for pinks, so hard to justify fishing for them financially). Then Monday and Tuesday the pinks dried up and we were almost exclusively sockeye. River is low and we were having outboard challenges. We ended up putting on a new outboard right in the middle of the high tide we were supposed to be fishing, so missed out on a lot of fish, but the new (refurbished 20 year old Yamaha) outboard runs so much better. 60 hours of fishing with few breaks is getting harder to do as I transition to fat old man and lose all my youthful energy. Thankfully I have Tanis to pawn off as much work as possible. He laughs at me because I ask to sit and rest, but get so frustrated watching him slowly pick fish that I’m back up in about 20 seconds to get the fish out of the web. 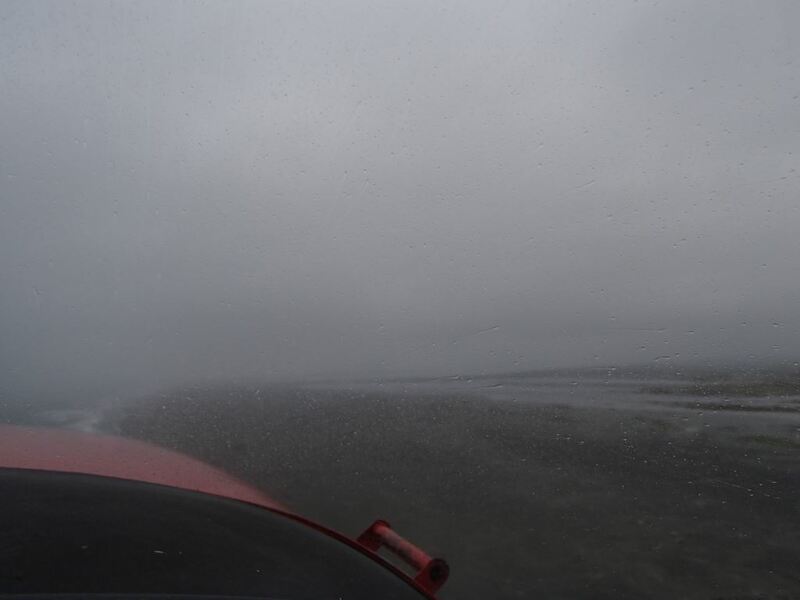 Weather has been consistently crappy – fog, drizzle, etc. Perfect fishing weather. Not so perfect flying weather. 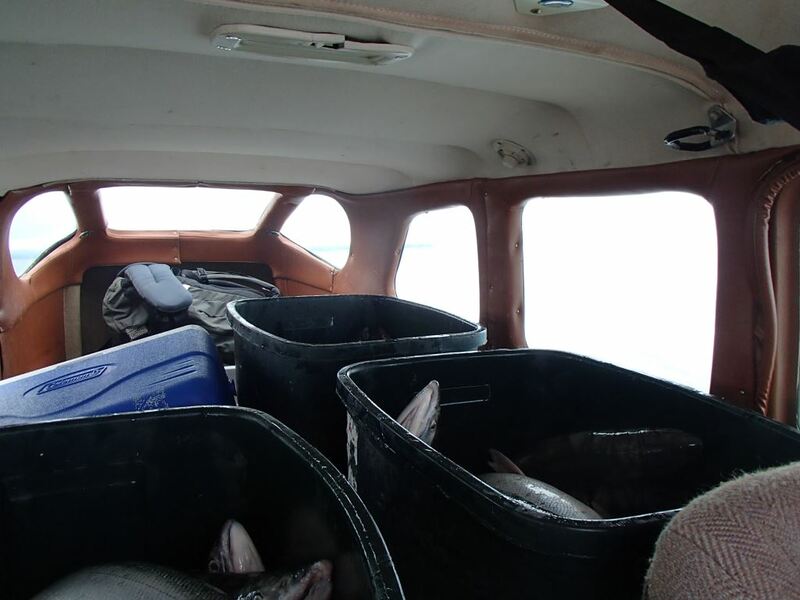 Was grounded a couple times I needed to haul fish to town due to the zero visibility. Now I’m just exhausted and in need of a nap. Thank you for your patience with Teen in the fly shop and with our Sunday/Monday closure. The season has only one more week for us out there – possibly two. Then we hit the August humpy lull before all heck breaks loose for silvers. As of this morning, the king escapement on the Situk has achieved ADF&G’s lower escapement goal of 450 fish. They have 466 large kings through the weir so far. This is a huge relief, since we have been consistently missing this goal for several years. ADF&G has had to take drastic (dare we say draconian) steps to make sure the kings reached that goal. Now that we have reached the minimum goal, they said they are thinking of some short-term changes, but wouldn’t specify. I did ask if that meant opening the Rodeo Hole and that was a no-go. We are just shy of 62,000 counted fish, so we’re close to doubling the limit. I’d expect them to make that decision over the next few days. It is apparent the Situk’s run was early and not extremely strong… Odd because out on the Akwe, the run is a bit above average, but right on time. East River is a good fly-out option as well, since they are seeing an OK run out there too. The Situk’s run has just been weird this year. And the pinks are starting to come in in big numbers, making sockeye fishing at the lower end more and more challenging. Few people have been fishing the upper river because there is a predominance of blushed fish up there, but with the additional closure below and now humpies galore, it is getting a lot more pressure up higher. OK, my annual rant… Had more than one new visitor come into the shop this season to complain about the other lodge guests badgering them immediately when they got off the plane about how you can only catch sockeye by snagging them… I guess it is one thing for you to abuse the run and fish illegally because you don’t know what the $#@% you are talking about. It is yet another for you to rag on people who DON’T want to fish illegally on the Situk. Hooked on the INSIDE of the li facing the fisherman, not the outside facing away as would happen with most flossings. Do sockeye feed? 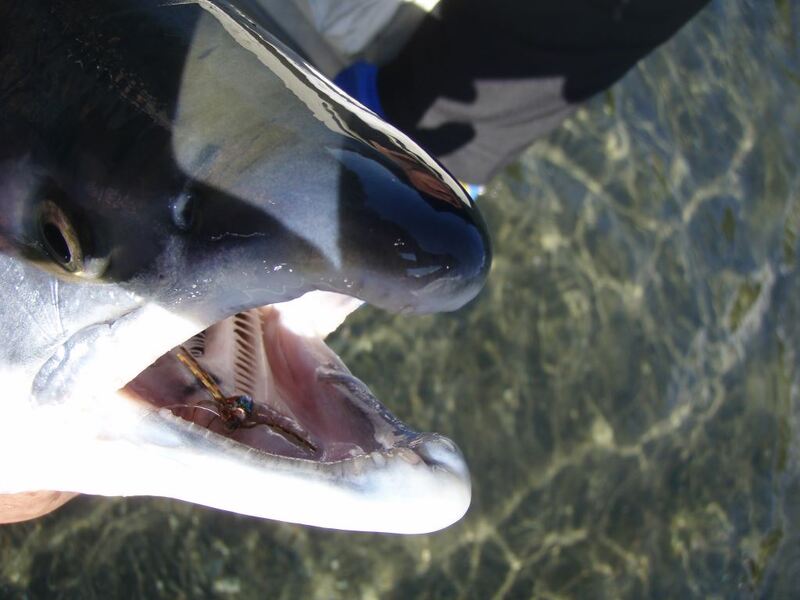 They don’t grow to 6 1/2 pounds by absorbing their nutrients through their skin (like their hooks). Sockeye feed on zoo plankton and invertebrates in the ocean. They don’t generally chase down other little fish like all the other species of salmon. They don’t hit Pixees and Dolly Llamas, so they get a reputation for being “uncatchable”. Bull crap. You just have to duplicate their regular food source, which is some small twitching little speck. Thus small and sparse (for salmon flies). And you have to totally deaddrift to them. They food isn’t high enough on the food chain to escape, so any swift movement (either by stripping or swinging) is a turn-off. I have no idea why anyone would spend thousands of dollars to fly to Alaska to snag fish. This time of year, it is the majority on the river. My most frustrating time of year, but also the most rewarding when I do get someone to do it right and they start outfishing everyone around them. Including spin guys outfishing the fly flossers when they rig it right and get the drift down. OK, rant is over. Thanks. Most people like to have sunny warm Memorial Days for the BBQs and parades. We are having a wonderful respite from the sun, with overcast and a chance of rain. It has been two weeks since the last real rain drop fell in Yakutat, so ANY overcast is a blessing and some rain will be a delight! Flows right now are hovering at a parched 129 CFS, making it a VERY slow float. 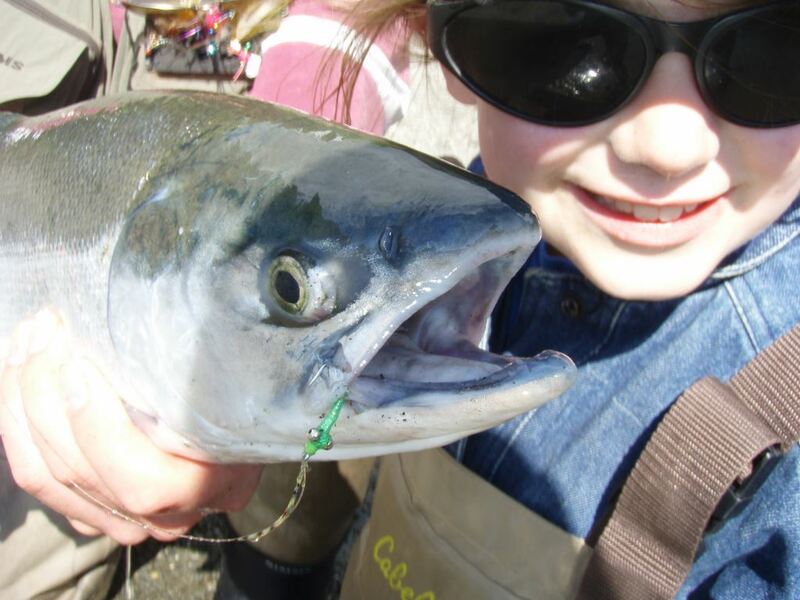 There have been reports that there are sockeye starting to appear in better numbers in the lower river. I haven’t heard if anyone is subsistence netting down in the estuary yet, but people have been seeing sockeye jumpers out in the bay over the past week or two. I think the sockeye are going to be early too, so be prepared for that and possibly hitting the magic escapement goal for the increased bag limit earlier than normal. 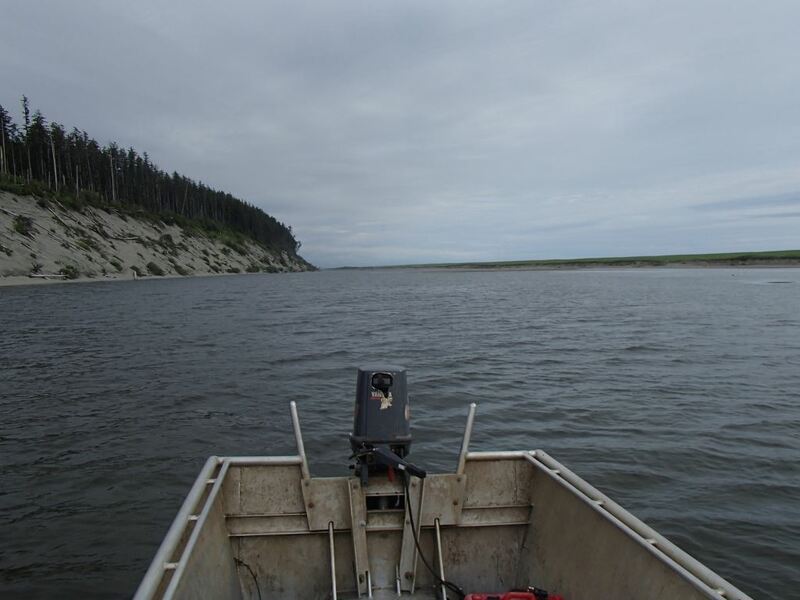 With that said, Gordy, our commercial fishing ADFG biologist said we are expecting a good run of sockeye this year, as all the regions are expecting good runs. Good fishing, but for those of us still dependent on gill-netting for feeding our families through our long Alaskan winter, we’ll be getting a terrible price too. Yes, we’ll be open tomorrow for most of the way, but I plan to take the family out to the cemetery in the morning. This is Memorial Day and I will make sure my kids understand its meaning. Veterans Day is for all the men and women who serve our country and protect our freedoms. Memorial Day is for those special ones who never get to return to their families and loved ones. 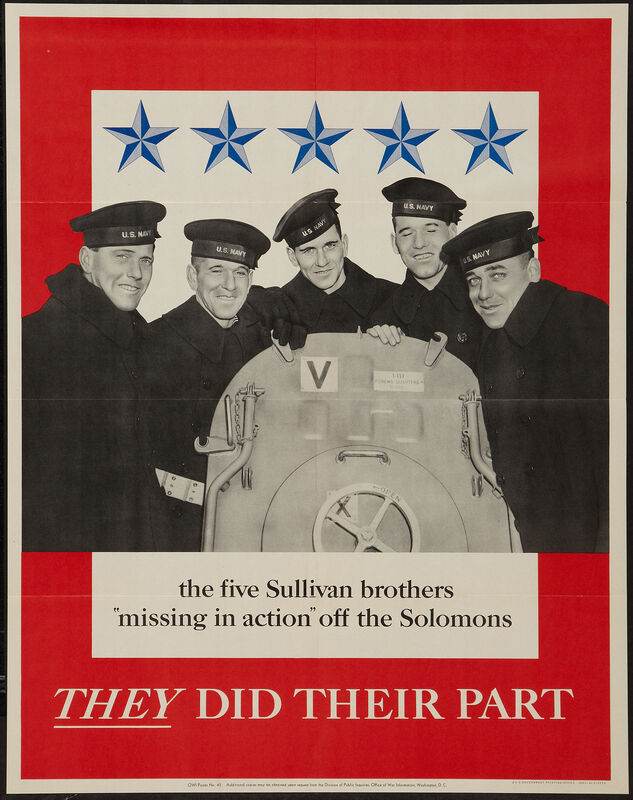 1.3 million Americans have paid that Last Full Measure of Devotion. Never forget them. Enjoy the BBQ, but take a moment to think about why you have the right to have it. Cherish your freedom and know it comes with tremendous sacrifice. May they rest in peace and may we find it in their absence. Unfortunately this year’s sockeye run is coming to an end. And I only made it out a couple times to fly fish for them. My favorite fish unfortunately runs in the middle of my frantically busy time. Between the fly shop, summer hangar construction, museum tours, Saturday Markets, commercial fishing on the Akwe and everything else, there just isn’t enough time in the day even with nearly 24/7 daylight. Comet dead center on the tongue. 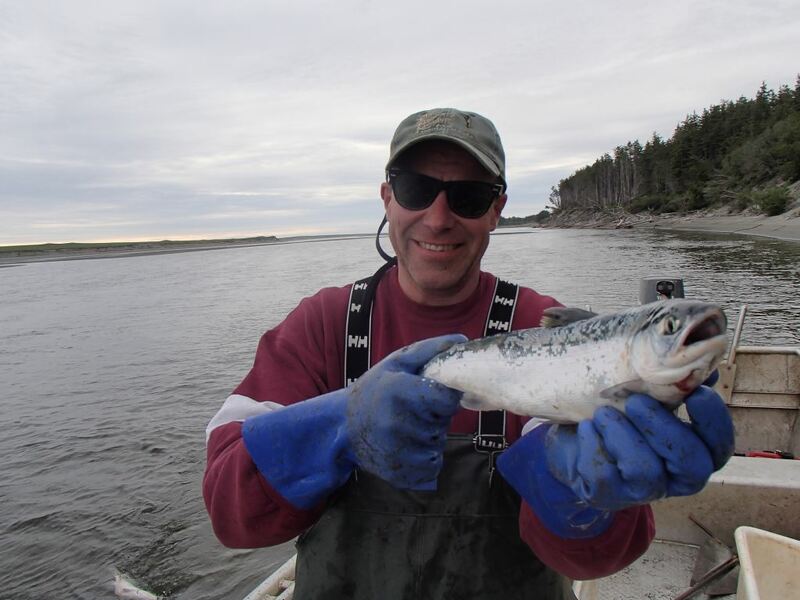 Jim Pook from down in Arizona sent me the link for a nice sockeye article on the Alaska Outdoor Journal. The writer “gets it”, although our preferred techniques are not the same. Same basic results though… From the fly shop perspective, the sockeye season is the most rewarding (and frustrating) season. Helping to educate anglers – both fly and spin – to entice these incredible fish to bite is a lot of fun. Having them come back in through the shop giddy about outfishing everyone else on the river is as much a thrill for me to hear as it is for them to actually do… Frustrating though to deal with people who will never get the incorrect notion that “sockeye don’t bite” and “you have to line ’em” out of their noggins. 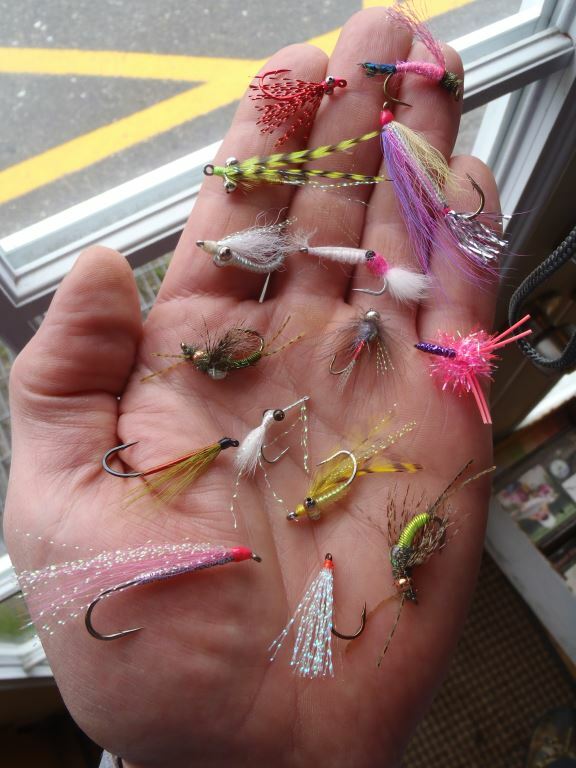 He recommends split shot and bouncing the fly along the bottom as though you are drifting a Glo Bug to steelhead. I prefer fishing a heavy sink tip with only about a foot or two of leader – short leader so the sink tip drags the fly down with it – but off the bottom. But the principles are the same – dead drifting little brine shrimp-looking flies into a narrow strike zone. I describe the behavior like this: Sockeye primarily feed on zoo plankton and invertebrates in the ocean. 1) they are small and sparse and 2) not high enough on the food chain to escape. 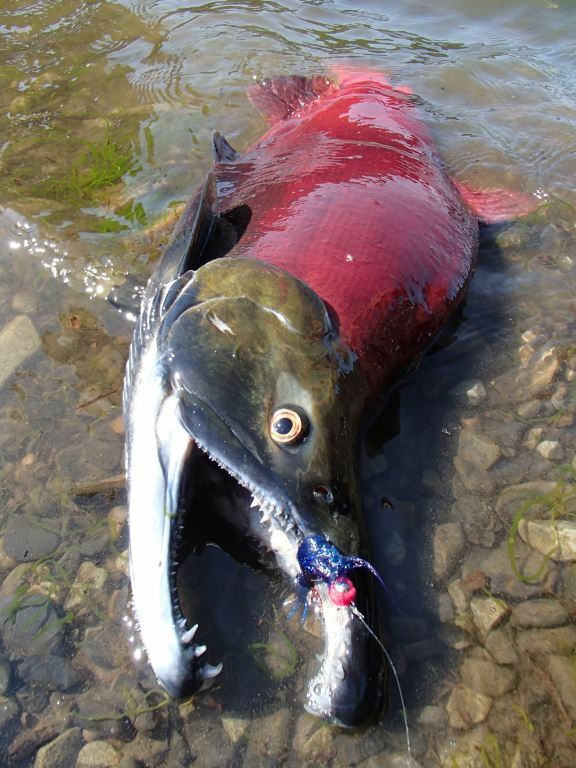 Sockeye usually don’t chase down their food, instead just lightly slurping the freefloating/twitching little speck. Put a lot of movement into the fly and they won’t be interested. Except… the longer the sockeye are in fresh water, the more they move away from displaying ocean feeding behavior and change to a territorial/defensive behavior. 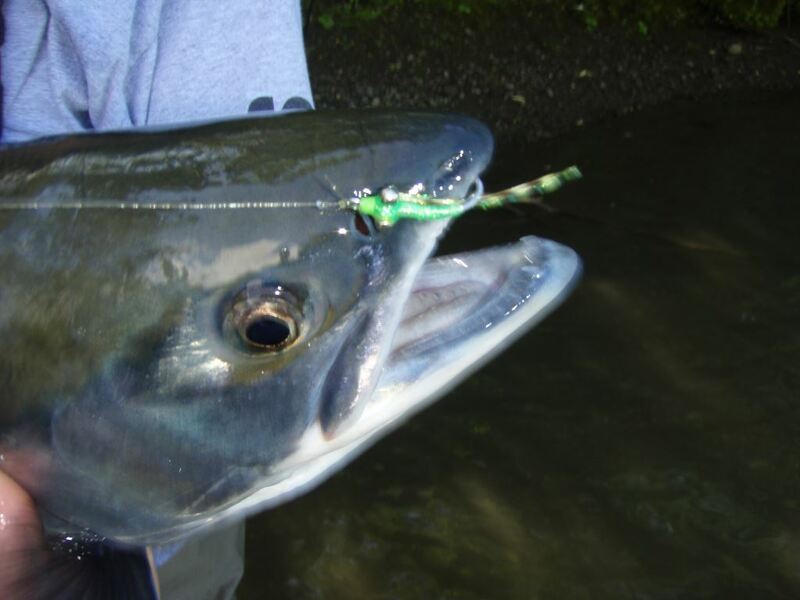 In the upper river and/or in the lake, sockeye will chase down larger streamer patterns and fish-like flies. 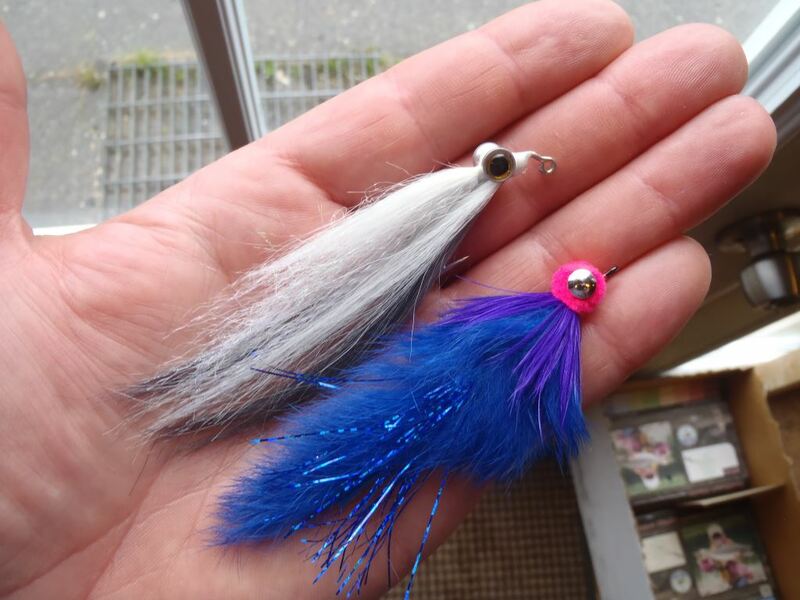 Last year up in Italio Lake, the two best flies were a grey saltwater Clouser and dark blue Egg-sucking Bunny Leech. The big bucks would chase after these flies threatening their territory. Active strip in the lake was a necessity, with no current to add movement to the fly. In the upper river, you have a lot of salmon fry and trout looking to feed on sockeye eggs. The sockeye will snap at anything as they get closer to spawning. Last week in the Upper Situk, our best flies were kind of on opposite ends of these scales… We fished a black and chartreuse Bunny Leech with success, but also the smaller Red Hots, Money Bugs and Mega-Prince flies. All of them had good reactions with the combination of bright fresh and dark red sockeye we had in front of us. Dead drift was most successful still, although we had a lot of rainbow trout chasing the stripped flies down. 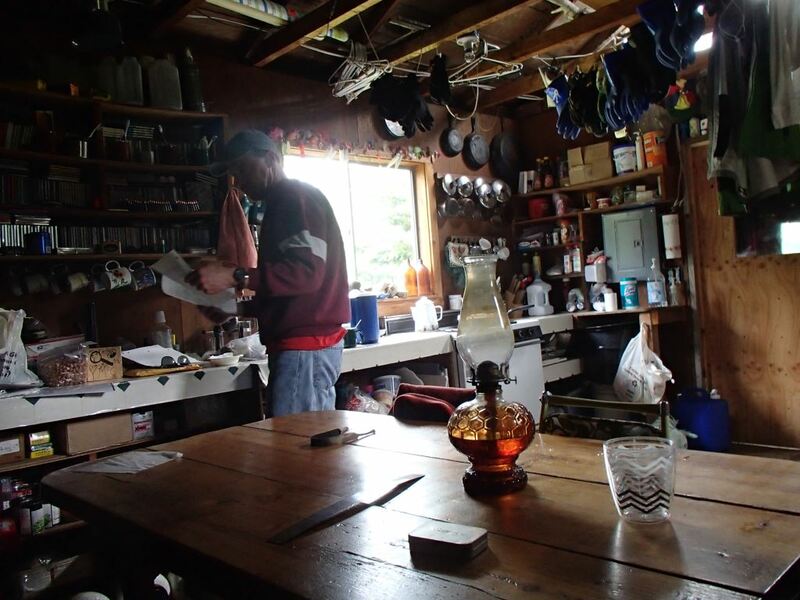 We inadvertently hooked three kings over two long days of fishing… I had this discussion on the phone with ADF&G and even had some criticism from the Forest Service for fishing the upper river last week… The upper river is closed to the “taking” of king salmon after June 30th. Fishing a large deep pool with about 50 kings, 500 sockeye, 100 pinks and 200 trout, who are you “targeting”? It was implied that because I used a large fly, I must have been targeting the kings and not the sockeye. Let me be perfectly clear in case the trooper is reading this – I have never hooked a king with a big king fly. Only with little sockeye flies since I learned to fly fish 15 years ago. I couldn’t keep the rainbows off the Mai Tai in a shallower stretch above the deep pool, but had three king follows with it as well. I yanked it away from the king to avoid hooking up in among the branches and snags. In the deep pool, you had a lot less control over which species, since they were all mixed up together. Hooking three dozen “they never bite and you have to line ’em” sockeye and three “they hit big flies” kings means we targeted which species? 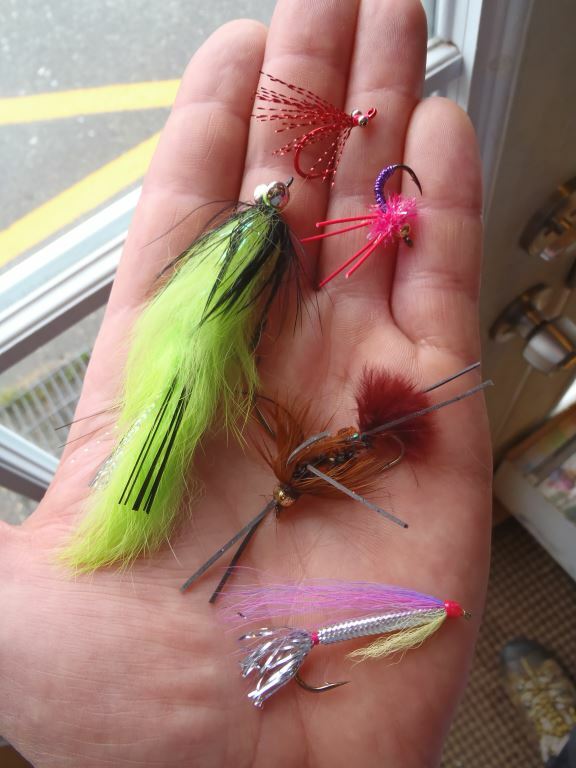 Although that grey Clouser that looks like a small herring would definitely be a “King fly” in my opinion, the Bunny Leeches are Silver flies. Last year in Italio Lake, I was targeting kings obviously (even if it isn’t possible for a king to get over Italio Falls and none were counted through the Forest Service weir that was in last year). That’s the fly I used. Whatever. This would be a fun ticket to fight. And for those of you following along at home… here is our last two weeks of commercial fishing on the Akwe in a word – bad. More specifically – “bad to worse”. We’ve been having a slow season anyway. A week ago, things picked up a little bit over the first two weeks. Tanis and I managed to land about 1400lbs of salmon each, which would be what we should expect for the worst week of the season, not the “peak”. This past week, we landed about 600lbs total between our two nets. We had some rain, which brought the rivers up quite a bit. 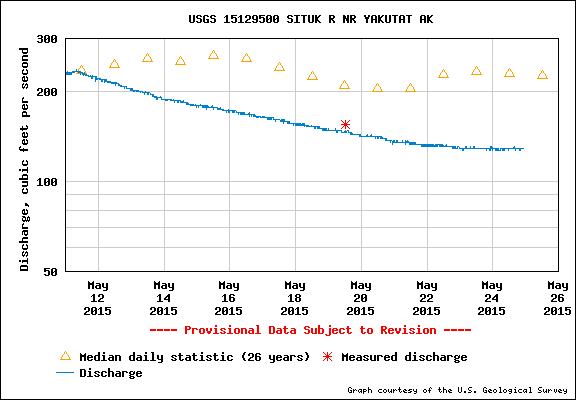 The Situk never broke 180 CFS, but both the New Italio and Akwe Rivers were flooded. Running dark and flushing a tremendous amount of debris downstream. It appeared that a beaver dam or two on the Ustay washed out and into the Akwe. Our nets – even 10 miles downstream from the Ustay confluence – were constantly filling with beaver sticks and branches. We were also blessed with big full moon tides this weekend, making it impossible to leave the nets in the river through the strong outgoing tides. The best we could do was set our gear up in some of the ordinarily dry lagoons somewhat protected by the sandbars. The one time we left my net in the current through the outgoing tide, the anchor dragged and swung the net downstream. We may have one last chance for catching something this season next weekend, but it appears the weak run of 2014 is basically over now. 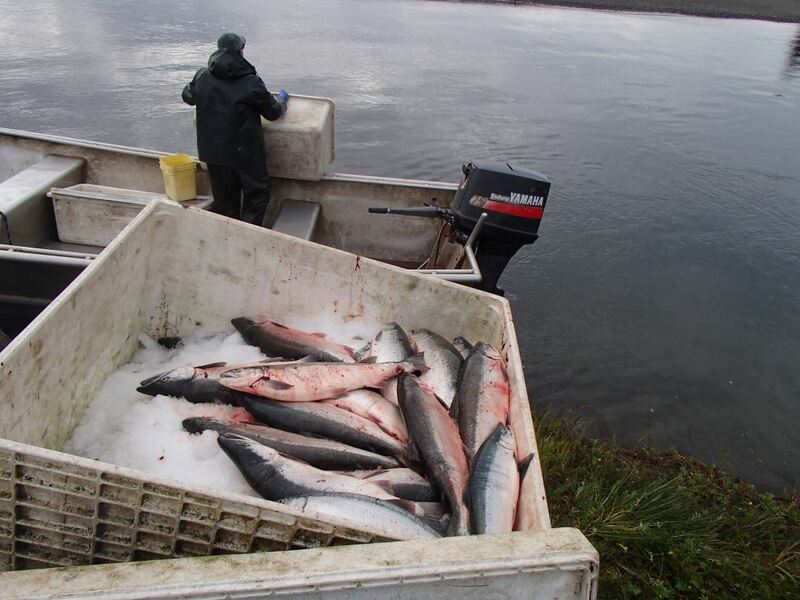 94 sockeye, one chum and two humpies were our take in week #4. Not quite enough to cover the week’s flights, fuel and food. Certainly not enough to attempt to make a dent in the permit fees, cabin fees, or aircraft insurance and annual costs. Oh well. That’s fishing. 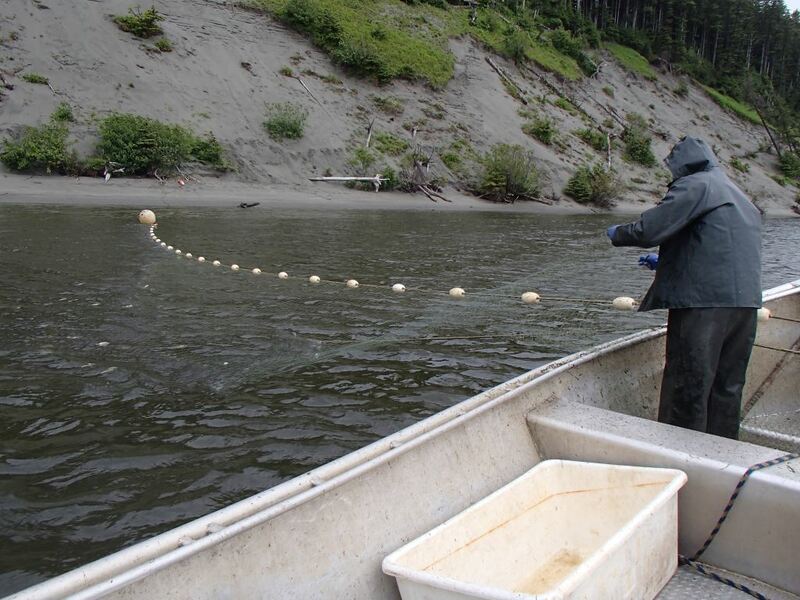 And since I seem to be the only “commercial fishing” fly shop owner in the world… And some of the fishermen coming to Yakutat are not exactly “fans” of the commercial fishing industry… Last week, we inadvertently caught a wild steelhead in Tanis’ net. We ate it. 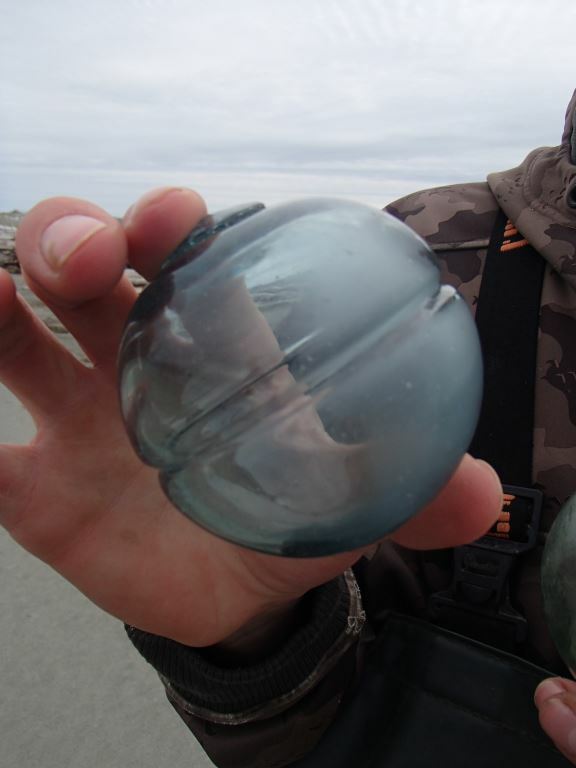 Bi-catch can be a really big problem with many fisheries. 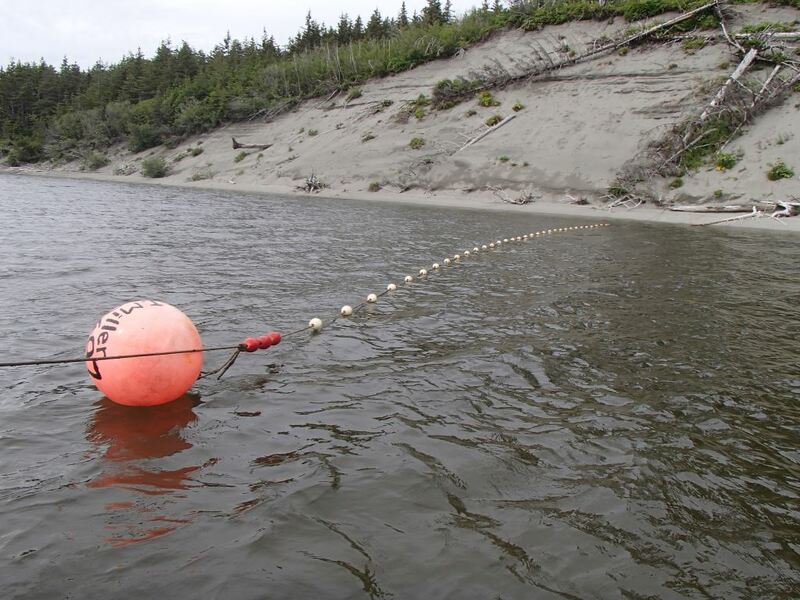 Net fishing in general gets a really bad rep because of the way some net fisheries scoop up everything in their path… The set-net fishing we do in the Yakutat area has probably the lowest bi-catch rate of any fishery in the world. We are not intercepting fish bound for other regions or river systems farther south with endangered runs. We’re up inside the river that is the species destination. Runs can be managed based on what the river escapement actually is, as opposed to ocean intercept fisheries where you have no idea where the fish are really bound. We do catch a handful of dolly varden char and an occasional sea-run cutthroat though. Most of the cuts are small enough to slip through the web and if they do get caught, it is because they are swimming with their mouth open and get flossed. Those can almost always be released without harming their gills for easy survival. Many of the bigger dollies get gilled and die, so we eat one or two every week while out there. Last week, we caught a smallish steelhead hen and she was dead when we came to her. 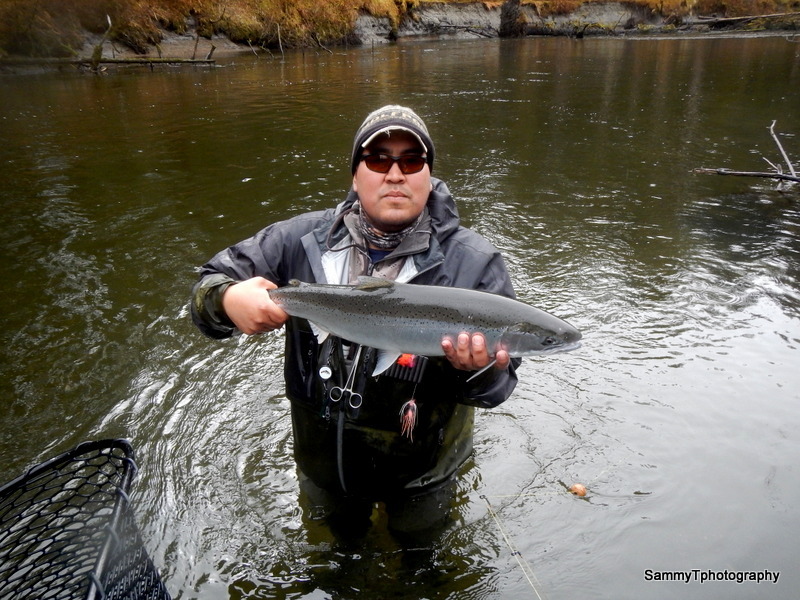 We usually catch two steelhead a year, which is pretty incidental an has absolutely zero effect on the run. We baked her along with a nice dolly, for a taste test. The dolly was nearly white when cooked, but still firm. Had a light flavor, but mostly tasted like the butter and garlic. 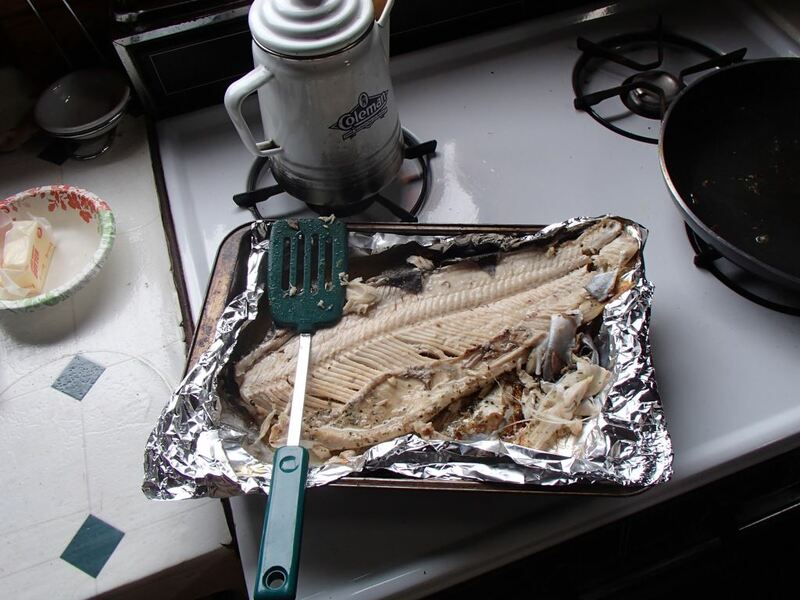 The steelhead hen was mushy and flavorless. 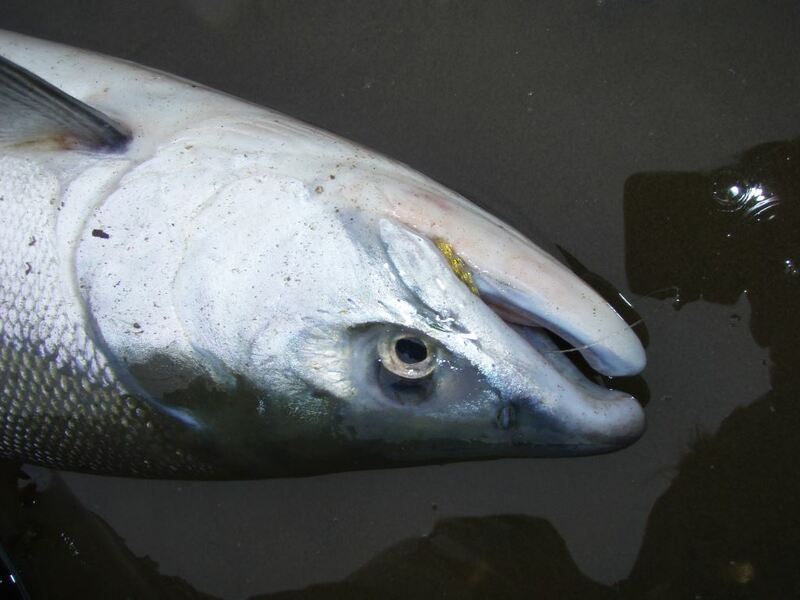 I would honestly rather avoid eating one of our local steelhead – not because of any environmental love for the species – but because they are an awful eating fish. I’d rather eat a humpie! I think I’d rather eat a spawned-out humpie. I’ll try and get some photos posted tomorrow before we fly out for what will probably be our last week of the season. The week started off a little better than the previous, but took a quick turn south. Again, the water conditions and weather were perfect, but the fish just didn’t want to cooperate. Definitely more fish in the river system, but the majority of the early run seems to hang out at the confluence for a while, then push up the New Italio instead of the Akwe. We did our usual of cleaning out the two sweepable holes, then settled in to see what the tide brings in. Just as last week, the tide brought literally nothing in. And again, we waited for the darkness to come with the hope that a few of those Italio-bound fish would mill around high enough into the Akwe that we would have a chance to catch a few. Taking a break from our action-packed fishing, Tanis found this really neat Japanese Glass Float with center groove for a string to be tied around. 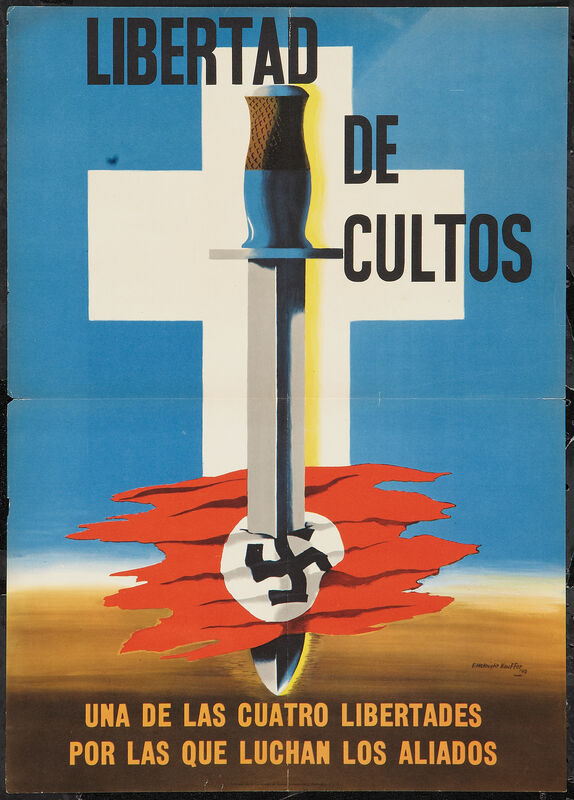 This is the first one of this kind that we have ever found. We did catch a few more fish on the night tide, but not many. Nothing again on the day tide, then it was time to pull the gear. Well, not “nothing”… I did manage 3 fish in my net the entire second day! All those little white blobs in the net are rotten eulachon – attempting to shake them as far from the boat as possible! 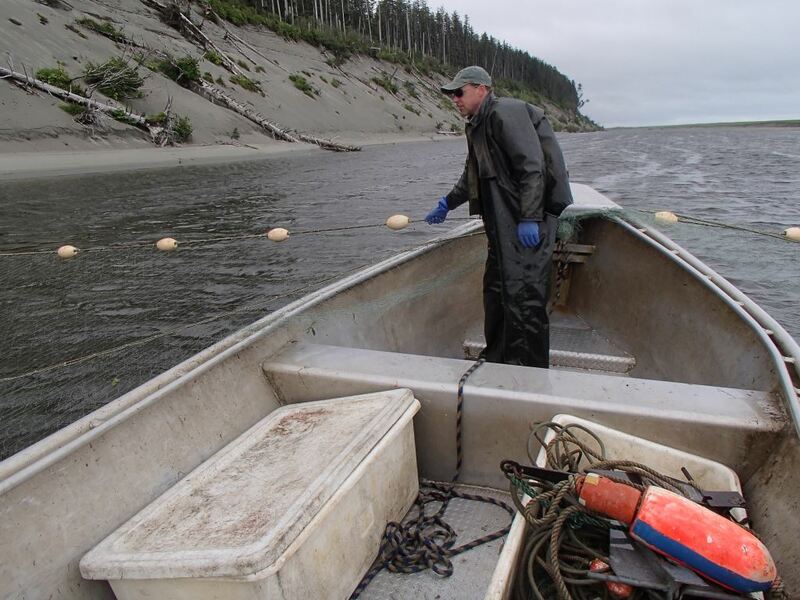 So far this season, a total of 2,000lbs have been sold off the Akwe River all nets combined. That’s a far cry from the usual we’d see. Oh well. That’s fishing. I like to say that if I can at least cover my expenses, then I’ll be happy, but that is what I say when we are doing significantly better than just covering expenses. We have a long way to go this season till we break even… Hopefully this week, but I just flew over the river and there were no fish at all in the confluence hole. A couple small pockets lower toward the mouth, but nothing above. Bummer.